Aldis Alexander Basil Hodge (born September 20, 1986) is an American actor, best known for his portrayal of Alec Hardison on the TNT series Leverage, MC Ren in the 2015 biopic Straight Outta Compton, Levi Jackson in the 2016 film Hidden Figures, and as Noah in the WGN America series Underground. Hodge was born on September 20, 1986, in Onslow County, North Carolina. Both of his parents, Aldis Basil Hodge and Yolette Evangeline Richardson, served in the U.S. Marine Corps. Hodge's mother is from Florida, while his father is originally from Dominica. Aldis is the younger brother of actor Edwin Hodge. Hodge played both the clarinet and the violin as a child, but as an adult, his focus is on the violin; he purchased his first at the age of 18. In addition to acting, Hodge designs watches, writes, and paints. In 2007, Hodge was awarded the role of Alec Hardison on the day of his 21st birthday. In 2010, he received a Saturn Award nomination for Best Supporting Actor in Television for this role on Leverage. He is also one of two actors to portray two different roles in two different Die Hard films, the other being Anthony Peck. 1999 Buffy the Vampire Slayer Masked Teen Episode: "Fear, Itself"
2010 Mad Usher, Sinestro, Frog (voice) Episode: "WALL-E-NATOR/Extreme Renovation: House Edition - Superman's Fortress of Solitude"
2017 The Blacklist Mario Dixon Episode: "Mr. Kaplan"
Black Mirror Jack Episode: "Black Museum"
2018 Star Trek: Short Treks Craft Episode: "Calypso"
Medal Of Honor Edward Carter Episode: "Edward Carter"
^ "Aldis Hodge Online - Est 2010 – All About Aldis". 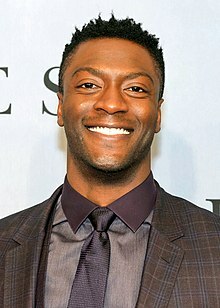 Aldis-hodge.com. Retrieved 16 March 2019. ^ The Weekend of Awesome aka Supernatural LA 2009 - Friday Archived 2011-07-18 at the Wayback Machine (April 21, 2009). "Whedonopolis". Accessed 2010-09-20. ^ Leverage ConCon The Guys Panel posted by supershinygirl. (March 24, 2010). "youtube.com". Accessed 2010-04-08. ^ 'Hmm Awards-Aldis Hodge Complete Interview' by JD247 (November 22, 2009) Youtube.com. Accessed 2010-02-09. ^ 'Interview: Aldis Hodge from Leverage' by Emma Archived 2013-11-03 at the Wayback Machine (December 5, 2008) Fanbolt.com. Accessed 2010-02-09. ^ 'Leverage Interview II: Talking with Dean Devlin' by Joseph Dilworth, Jr. (December 11, 2008) Pop Culture Zoo. Accessed 2010-02-09. ^ 'Nominations for the 36th Annual Saturn Awards' Archived 2012-07-17 at the Wayback Machine (2010) The Academy of Science Fiction Fantasy & Horror Films. Accessed 2010-09-20. ^ ""The Blacklist" Mr. Kaplan (No. 4) (TV Episode 2017)". IMDb.com. Retrieved 16 March 2019 – via m.imdb.com.